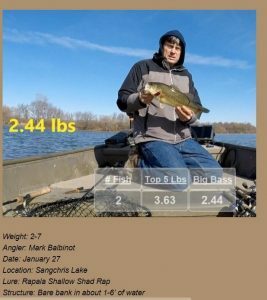 For anyone not familiar with the Top 5, it is an audience participation project for anglers to submit their catches for public consumption on what I like to call a virtual brag board. 2018 marks year number five of the project and it’s been an entertaining addition to my fishing and writing hobbies as well as something to look forward to with weekly update postings each Monday. We already have two updates in the books this year, click these dates to check out the postings from 2/5 and 3/5 . Screenshot from our first 2018 update. While the first three years were devoted exclusively to bass, for 2017 the project was expanded to include other freshwater species. I will accept either weight or length data based on the angler’s preference so there will potentially be separate categories within species according to the information provided. One stipulation is that the fish be landed via rod and reel. I don’t really have any minimum criteria on other species at this point as this is still a work in progress to see what may turn up. I’m also going to leave each species on its own for this experiment. For example, the catfish family will all be separate, thus a flathead Top 5, channel cat Top 5 or even a bullhead Top 5 if that’s your specialty. The amount of information you are willing to share is entirely up to you. I’m a more information the better guy but I get it if you’d rather remain somewhat elusive. 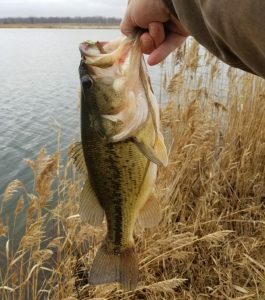 I have compiled a database of the 485 bass and handful of other species submitted over the years and it’s always fun to take a look at the record book. Thus, it would be cool to have it dialed in, but I’ll take whatever I can get. 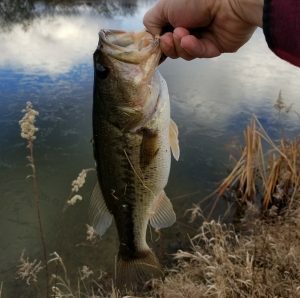 Dad and I were able to sneak away for a little Easter Sunday bass fishing on our “home lake.” My only bass of the day and first of the year but a cool way to kick it off, came on a perfect setup as I slowly ran my spinnerbait parallel to a submerged log, just like you read about in the magazines. Step One: You catch, weigh/measure, document and photograph a fish that resides in your Top 5 heaviest of 2017. Been a rough winter around here so pretty slim pickings to start the 2019 Top 5. If it weren’t for some dedication from Top 5 veteran, Jim Junk, we’d be shutout. His New Year’s Day bass saved the day and stands as the lone entry to date. Winter arrived in full force shortly after that catch resulting in the first February blank since kicking off the project back in 2014. But, as always, if we’ve got fish, we’ve got a monthly stat update. I don’t know about you, but I sure think that there just aren’t enough fish pictures on the internet. So, five years ago, instead of just griping about it, I decided to do something about it. Now, I’ve been sharing my own fish pics for almost seventeen years but figured the more the merrier. After all, if you’ve seen my level of fishing and the limited time I have to get away, well, you are aware that I need some help. Enter the Top 5 Project back on March 21, 2014 to provide an assist via the catches of fellow anglers. Just over five years later our dynamic group continues to do its thing to address the dearth of fishing pictures (and stories). 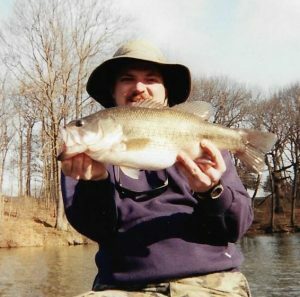 Which brings us to a milestone, Top 5 bass #600, caught by Jim Junk and detailed below. 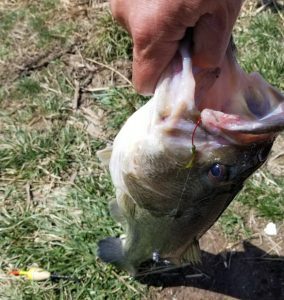 Angler Comments: Had some minnows left over so hung one from a bobber and then cast the bank with a swim jig for a while. Look back and don’t see the bobber so reel in slack and set the hook on something with some weight to it. Started stripping line and we went back and forth for about 15 minutes. Finally got it to the bank and grabbed its mouth. I am pretty sure that reel has 4# line on it, 6# at the most. It was really fun! Now that’s what it’s all about, a good fish, a good story and a couple good lessons. First lesson being the old adage that says “the best time to go fishing is anytime you can.” And Jim’s catch is proof that as long as you’ve got a bait of some sort in the water, anything can happen.